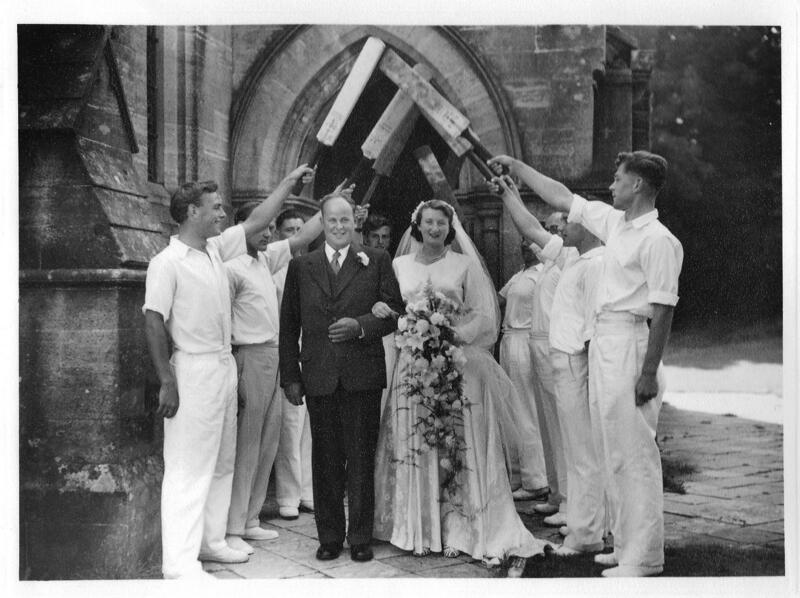 In 1953 on September 9th at St James’ Church Kingston, Mr John Vincent Barnes of Afflington, married Miss Patricia Mary Meaden, of Gorcombe Farm, Charlton Marshall, near Blandford. Pat and Jack Barnes, as they were known, started their married life at The Lookout as they farmed 350 acres in the Kingston to Harmans Cross area. They had two children, Judy and Michael, so in 1965 moved to live in the main farmhouse at Afflington Manor Farm, as Jack was having to drive up and down Kingston Hill several times a day to milk the dairy herd. Many happy years were spent here running the mixed dairy farm and bringing up the family, which now has a new generation of grandchildren, some of whom are still in farming. 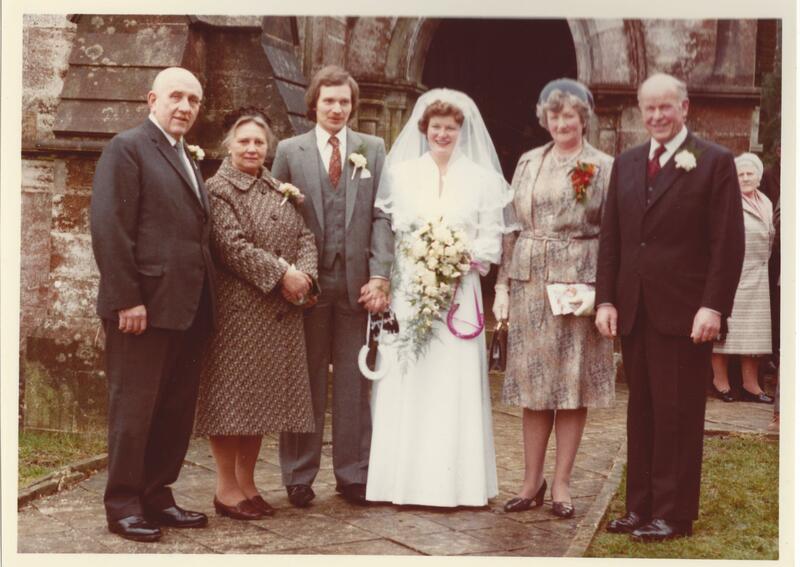 On February 16th 1980, at St James’ Church Kingston, Mr Richard Forgan of Stoborough, married Miss Judy Barnes, who was brought up at Afflington Farm. After two years they moved to Wareham and they later had two daughters, Sally and Katie. 27 years later, in 2009, the family returned back to settle again in Harmans Cross. 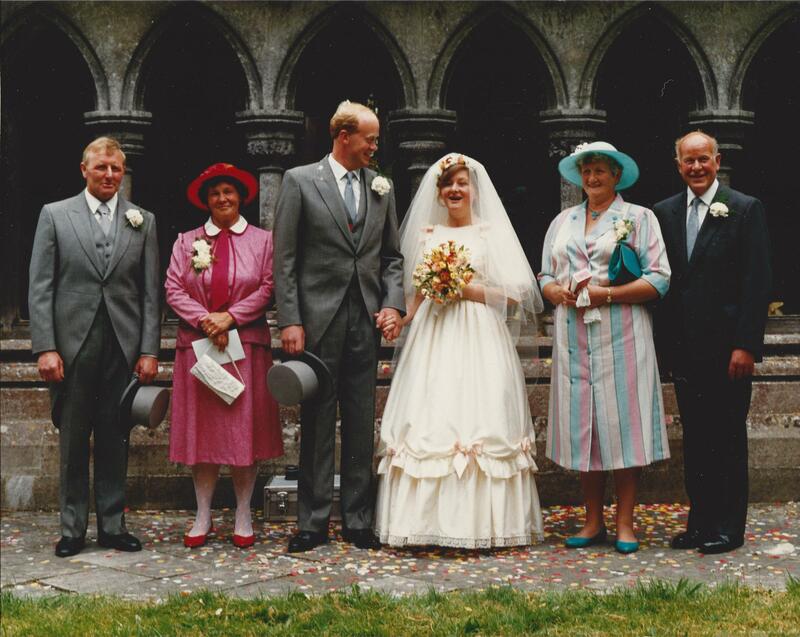 On July 5th 1986 at St James’ Church Kingston, Mr Michael Barnes of Afflington, married Miss Linda Hooper of Worth Matravers. They still farm in the Purbeck area at Purbeck Valley Farm and now have three sons, Ashley, Daniel and James, who are continuing in their parents’ footsteps. On a beautiful day in August 2014 at St James’ Church, Kingston, Miss Sally Forgan and Mr Richard Lewis were married. Sally, daughter of Richard and Judy Forgan, was brought up in the local area, and Richard, son of Michael and Sue Lewis, comes from Exeter. Revd Gaynor Burrett took the service and about 120 guests attended the Marriage Ceremony. This was later followed by a reception at the Isle of Purbeck Golf Club and the couple, who both teach in Somerset, spent their honeymoon in Borneo, Bali and on Lombok Island. Well-known Purbeck family, the Scotts, are selling an historic manor house they had planned to make their family home. Rupert Scott, who sold Encombe House, near Kingston, two years ago for a reported £16million, has now put Afflington Manor Farm on the market for an estimated £2.25million. Afflington Manor Farm, between Corfe Castle and Swanage, is a Grade II listed 17th-century manor house set in 360 acres. The Scott family are believed to be dividing their time between Purbeck and the south of France. The family still owns a substantial amount of land in Purbeck along with a number of properties. Afflington Manor Farm had been the subject of heated debate among planning chiefs at Purbeck District Council over a complex set of proposals for alterations. Objections were raised over the cumulative effect of the alterations but, after months of negotiations, planning chiefs finally gave the go-ahead on plans which included building a swimming pool and converting pigsties into boiler and changing rooms. A Victorian staircase at an historic manor house in Purbeck is to be ripped out despite calls from conservationists that it should be saved. Purbeck district councillors approved the plan after a visit to Afflington Manor Farm at Corfe Castle, once an important property in the 17th century which oversaw the manor of Afflington. The grade II listed building has undergone alterations over the centuries but had fallen into disrepair in recent years. Well-known Purbeck family, the Scotts, have won permission for a series of alterations to an historic manor house they hope to make their family home. The former owners of Encombe House, which was sold for a reported £16 million, plan to set up home at Afflington Manor Farm between Corfe Castle and Swanage. Proposals for a complex and wide-ranging package of alterations have been the subject of 18 months of negotiations with planning officers at Purbeck district council. The grade II listed former manor house was originally a 17th-century courtyard house – it was more recently used as accommodation for farm workers. Members of the planning board agreed to the removal of 19th-century partitions – provided they are surveyed and recorded – to make way for a “manorial chamber”. Permission was also given for a swimming pool, with the conversion of pigsties to boiler and changing rooms. Members of the planning board visited the site before making their decision on the cumulative effects of a wide-ranging series of proposed alterations. If you’ve ever fancied yourself as a titled aristocrat, the chance could be yours – if you’re prepared to pay the right price. 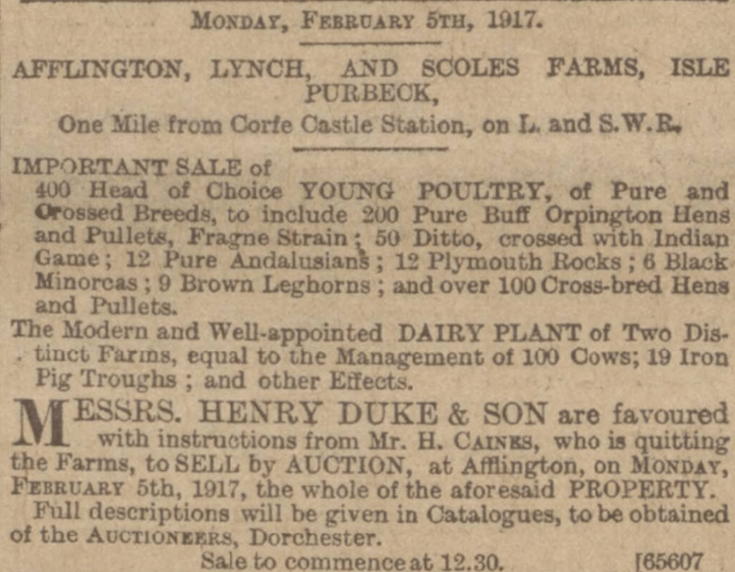 A number of Lordship titles based in Purbeck are up for sale at auction and prices are expected to fetch around £8,000. Among the feudal titles available are the Lordships of Stoborough, Langton Wallis, Affrington and Worgret. The Lordship of Worgret lies in the borough of Wareham and the title is being offered for sale by the daughter of the third and last Baron Alington. As title holder your manor would include one of the oldest churches in the country, St Mary’s – the supposed burial place of Anglo Saxon kings. It also covers a number of ancient barrows where Bronze Age burial urns have been found. The Manor of Stoborough is believed to have once been part of Wareham Priory. An account of priory possessions during the time of Henry VIII includes assized rents in ‘Stowbarowe’ to the value of 9s2 and a half d. The title was acquired by John Scott, third Earl of Eldon, who then passed it to his second son Sir Ernest Stowell Scott KCMG who died in 1953. It is being offered for sale by this branch of the family – David Eldon Scott, a great nephew of Sir Ernest still lives at Encombe House, Corfe Castle. The Manor of Langton Wallis lies at the west end of the parish of West Langton. It was probably the ‘Langetone’ which at the Domesday Survey in 1086 belonged to the wife of Hugh Fitz-Grip. It was acquired by the third Earl of Eldon in the 19th century. The Manor of Afflington just south east of Corfe Castle was sold to Lord Chancellor Eldon in 1822 and is now up for sale by his descendents. All the titles are being auctioned by private treaty sale by London based Manorial Auctioneers – one of several companies selling titles around the country. They can be contacted on 020 7582 1588. KENT – HAWKINS. – Nov. 16, at Alton St. Pancras, by Rev. E. C. Collard, William Francis Kent, of Afflington, Corfe Castle, third son of James Kent, Esq., Lynch, to Alice Susan, eldest daughter of the late Charles Hawkins, of Alton Pancras. AFFLINGTON or ADLINGTON FARM, situated in the parish of Corfe Castle, in the Isle of Purbeck, and county of Dorset, consisting of a farm-house, dairy-house, barns, stables and necessary out-houses, and 352 acres, three roods, and five perches of arable, meadow, pasture and coppice. For a sight of the premises, and further particulars, apply to Mr. Filliter, attorney at law, Wareham, Dorset. Various sums of Money ready to be advanced on Freehold Land security. Enquire of Mr. Filliter.